Seven years ago, Kizzy Texeira moved from Puerto Rico to Pennsylvania for a new start in life. Work was hard to find in Puerto Rico, and she had three girls, Naisha Liz, 6, Nicole Airine, 14, and Nathalie Lugo, 16, all depending upon her. She had done her research prior to the move and arrived with nothing more than a housing voucher and $500 to her name. Kizzy’s next big step was to set up a savings account with Dauphin County Housing, and then she enrolled in the CareerLink programs. Soon after, she landed a job at a medical billing company. There she was promoted within just 6 months, and in another year, she was the manager of her department. Focused upon her goals, and with the encouragement and guidance of her case manager, Kizzy went on to enroll in school at Penn State for her associate’s degree. When she arrived here, her goal was to purchase a home within two years so she was connected with our First Time Homebuyer Classes. Kizzy registered and attended all three of the workshops, even following up by meeting individually with our credit counselors to better understand her credit. Kizzy learned what to pay, what to dispute, and how to increase her score. Within six months, she purchased her very first home for her and her children. 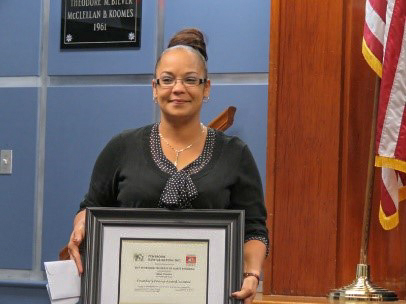 Kizzy’s home was recently recognized as a “People’s Choice Merit Award Winner” by her local neighborhood revitalization community. She has continued to work hard toward her goals and is just one semester away from graduating with a degree in social sciences. Kizzy is also working full time as a visiting outreach specialist, providing case management to expectant mothers and families experiencing poverty.